Geezer Butler’s Bass Rack is not something that many have considered over the past two videos. Parts 1 and 2 were quite a task and took many hours cross referencing sources. Unfortunately there was some information that never made the cut for being irrelevant with the pacing and overall vibe. In addition to this, as time went on I received feedback filling in a bit more of the picture of things that I wasn’t aware of. Today’s post we talk about Geezer Butlers Bass Rack and some follow up to the past two episodes. I came across two pictures of Geezers Butler Bass Rack which are dated from early 2016. This was the start of “The End” tour and as you can see, he actually has two racks. Looking at the pictures, he’s using a Hartke rig and an Ashdown rig. 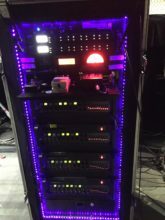 Ashdown made a custom rig for Geezer in early 2016 (see below) its purpose was to run his cabinets at full range. +In this picture it looks like one APM is missing as in a different picture you can see x3 GZR preamps and x4 RPM stereo amplifiers. The Geezer Butler Head of Doom was created for consumers which consolidates this bass rig. Downsizing the units dramatically and making it easier to use. You can find out more on our Geezer Butler Head of Doom page. I contacted Ashdown and another guy who worked one of the shows for some information about this set up but unfortunately came up dry. We do know Geezer used the Hartke rig during the tour of “13” so this is his main touring equipment. 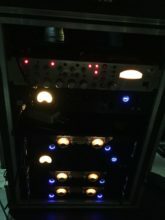 The End tour started in late January 2016 and in March, Ashdown released a statement of their custom GZR ABM RPM preamp. From this information we can presume he was testing and easing in the Ashdown rig and phased out the Hartke rig. I have no evidence of this but from the direction of his gear this is outcome. Some additional details about the Ashdown rig, was that the Ashdown RPM-JE was modified with 2 more additional outputs (4 in total) and these were especially modified to be “extra boosted balanced outputs” according to Ashdown. If you were to Daisy chain these amplifiers together you would experience electrical interference by way of an earth-loop and these outputs prevented this. 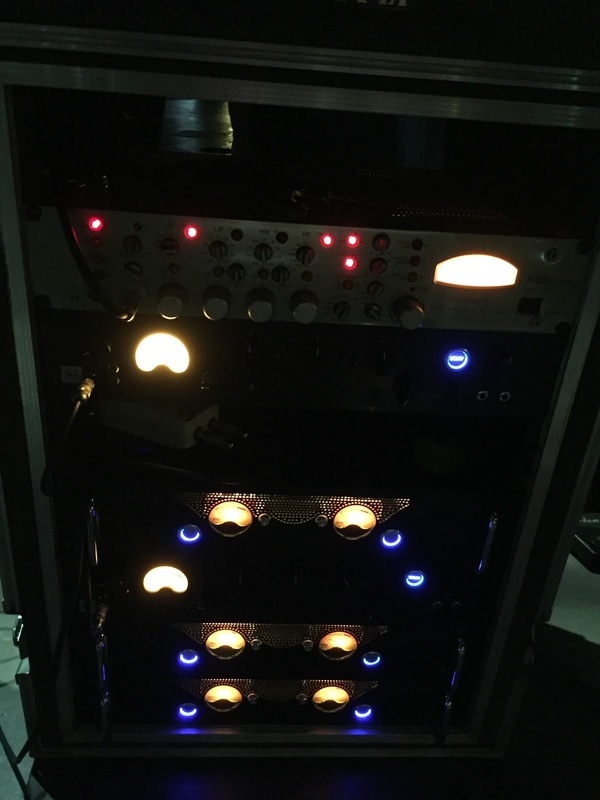 An article from FOH online Black Sabbath’s Swan Song dated 12 March 2016 (one month later) stated he used an “Electro Voice ND38” on the 12 inch cabs (aka Electro Voice RE38N/D). In an video for EMG titled Geezer Butler talks to EMGtv dated 26 March 2016, he’s seen with another microphone. There was some disappointment that some basses used throughout the 80’s and 90’s were missed out. Just to make everyone happy, lets complete the list and a link to the Geezer Butler Bass Rig if you missed it. During the recording of “Heaven and Hell” Geezer stated he wasn’t happy with his bass tone. He met with BC Rich owner Bernie Rico who hand crafted him a bass. During The Last Supper DVD which was shot during 1999’s reunion tours. Geezer played French made Vigier basses. One comment on the channel had me scratching my head in search of an answer to the following ““What about the phaser Geezer used?” Geezer isn’t known for regular use of effects so I had to be sure and find out for myself. I found two articles both burred deep in the web archive which mention Geezer using a custom Yamaha effects board and a second Tycobrahe Flanger model. So there you go John Wright props to you sir I hope that answers your question. You’ve always experimented with effects. Can you name some of the units you’ve used in the past and what you ‘re using now ? I don’t use anything at all now (1995) except for a chorus pedal and a flanger, just in the Ozzy stuff. I used to have this Yamaha pedalboard, I think they only made a few of them. It was like an experimental thing – I don’t think they ever went on sale. I used that particularly on the Born Again album. There was lots of stuff on that – all those weird, bloody things that everybody thought were keyboards! It was bass! I tend to sort of try something and then once I’ve done it I really don’ t go back to it – like the wah wah on “NIB,” for instance. Unless it works really well I won’t bother with it. I just prefer playing straight bass. This interview originally conducted Oct 14, 1995. What did you use for effects? I had two Tycobrahe pedals. With their wah-wah, which was a big blue pedal, you could get a weird sub-bass effect. Combined with their flanger, it created a really ethereal sound. I used that on the beginning of “The Writ” and on “Zero the Hero.” People think it’s a keyboard making those sounds, but it’s bass through the Tycobrahe pedals. On Ozzfest, I’ll be using my old Tycobrahe wah, although it’s a bit worse for wear these days. There we go, that concludes our Geezer Butler journey. I hope you’ve enjoyed this additional post and I feel better all of this information is now out there. Behind the scenes: This video was made as an informal chat to the viewer, where usually the series is presented as a show and tell. If you like this casual chit-chat typed theme please tell me as it’s far easier to make these videos than standing in front of a green screen all day! We are still on for season 2 and production on the next videos are under way and an update video is still to be made. Say “Hi” to me on twitter @AlfieWilliams and make sure you subscribe to the channel over at YouTube so you don’t miss out.